Secret Recipe Malaysia: Enjoy 2 dishes of your choice for RM20 only! Location: Valid at all Secret Recipe outlets nationwide excluding KLIA, PGIA, Subang Skypark, KTIA, KIA, PPUM, Tapah R&R, Aeon Mall Taiping and Medini Mall. 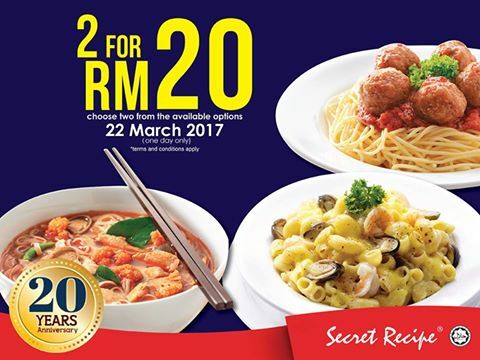 On 22 March 2017, you can enjoy 2 dishes of your choice for RM20 only! Don't iss out this ONE-DAY-Only promotion! Terms & conditions apply. Valid for dine-in only on 22 March 2017 only. Promotion valid while stocks last. Food selection may vary depending on outlet location. Not valid with other on-goings promotions, bank discounts, privileges, set meals or offers. Pictures shown are for illustration purposes only. Pricing is inclusive of 6% GST where applicable.